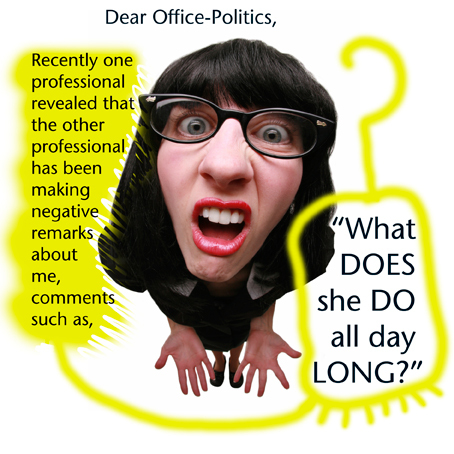 Office-Politics » What does she do all day long? I work in a small group of four people—one manager, two professionals, and myself. My position is a cross between professional and support duties. The manager and myself are assigned to multiple programs. The two professionals belong to one program. These programs serve a tremendous amount of external clients (over 7,000). I can never keep up with my professional duties much less providing adequate office manager functions. My manager understands. He pitches in when he can but often asks the two professionals to assist me with the professional work in the program. Another piece to the picture is that this critical professional applied previously for the manager’s position, but was not hired. She did not compete against the current manager for the job. She was hired at a later point into the lower position she holds now. She often criticizes the current manager. I suspect she is bitter about not having been chosen as manager, though she denies it. Now she’s applied for a position above my manager. She is well qualified and has a good chance at making it. She is a good employee—knowledgeable and hardworking. I am also skilled, knowledgeable and hard-working though (18 years experience with good reviews). Regardless of where she lands, I’m wary of someone spewing negative comments like this. If she is promoted, I don’t want her critical ‘misperceptions’ coming out at the new place and poisoning others. Should I say something to her? If so, what and how to say it (obviously, calmly, professionally, with respect and one-on-one)? She is definitely someone who is into hierarchy and control and tends to be someone who keeps pushing unless you assert a boundary with her. Any thoughts, suggestions, readings I would much appreciate. First, I very much appreciate your professional maturity in being able to recognize the good points of the person who’s been making negative comments about you. That can be a difficult thing to do (we tend to demonize those who hurt or upset us, making them 100% bad in our minds). Your objectivity is a great starting point for resolving this issue. Let’s begin by assuming that her criticism of you has very little to do with you. It sounds as though this is simply a habit of hers (you say she criticizes your boss in much the same way), and she may be largely unconscious of doing it. You also say she is hardworking and knowledgeable – so I assume she values those traits in others. So, I’d suggest that you ask for a meeting with both the professionals. You can tee it up by saying that you’ve realized that, since your role is such a mixture of support and professional duties, and that it changes according to current circumstances, it may not be entirely clear to them how to work with you most effectively. Then use the meeting as a real roll-up-your-sleeves-and-work-together opportunity. First, clarify your role, and how your time tends to be used on a day-to-day basis. Then ask them if there are ways you could use your time differently to support them better, or ways the three of you could work together to get the work done more efficiently. Spend the rest of the meeting looking for ways to understand each other’s responsibilities and team together in the most productive way. Your colleague will not only get a much clearer sense of what you actually do, but she will leave the meeting with the sense that you’re committed to working with her in a way that both supports her and her peer, and best accomplishes the work of the department. I think this may be your best shot at reducing her criticism, and solidifying her as an ally. Hope this is helpful – let us know how it works! Thanks for writing to OfficePolitics.com. Question: are you ‘doing things right’ or ‘doing the right things’? Perhaps you are comfortable with your office manager duties so are spending too much time on these duties to the detriment of your professional duties. Hence your professional colleagues frustration and question of what do you do all day. Be honest, which duties do you get motivated to do? The office manager duties (where you are your own boss) or the professional duties (where you are the junior in the team)? Your colleagues are not seeing the work you are doing whilst you have your office manager hat on – hence the criticism. They only see output from you when you have your professional duties hat on (which may not be often enough). Its easy to fall into the trap of working efficiently but not effectively. Thus, as an office manager you are being very efficient but it means you are not being effective on your professional duties. Been there done that. Nevertheless got offered a different job witih more independence. Then management had a real look at what was going on, namely that I previously spent most of my time waiting for a micromanaging supervisor to stop day trading using office resources and get back to me about work submitted for supervisor approval. I’ve seen lots of people eventually reveal their faults in a way that couldn’t be ignored. I’m sure this person’s time is coming. I think that it might be in your best interest to talk to this professional, maybe even with the company of the other two co-workers, seeing as one of them is aware of her actions and the other (the manager) is becoming a victim of her unkind words. If you meet with these people, but focus your attention on this woman as to let her know and make her aware of what it is that you do, she will obviously have a different view on the role that you take in the office. Because your office is so small, I don’t think it would be a good idea to ignore it, because there will always be that constant reminder of her ways. It’s quite obvious that she is irritable about not having the manager’s position, and judging from the way you described her, both good and bad, she probably likes to be in control. As long as you kindly make her aware of her actions and how it makes you feel by saying it in a way that makes you comfortable, you could probably alleviate the tension that you are experiencing. My adive to the Unjustly Accused is to use the strategies and tactics aimed at building relationships, display loyalty, manage your impression, ask satisfied customers to contact your boss, be courteous-pleasant-and positive, ask advice, send thank-you notes to large number of people, and flatter others sensibly. I believe that the Unjustly Accused should focus on being courteous, pleasant, and positive to the person making the negative comments. I was told that if someone does not like you, then try your best to find out what that person likes, or wants in life and talk to them about it, try and be their friend.